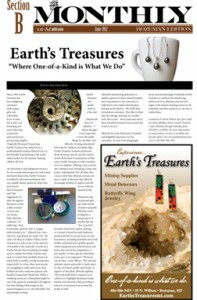 Since 1989, Earth’s Treasures has been delighting customers with unique gifts and collectibles from around the world, rock hounding and metal detecting accessories and recreational prospecting supplies. Originally Montana Prospecting, Earth’s Treasures has shifted from a predominantly mining related focus to a kid friendly shop bursting at the seams with wonders for the treasure-hunting child in all of us. An information and equipment resource for the recreational prospector, rock hound and metal detectorist, Earth’s Treasures is staffed by informed enthusiasts that can capably answer questions (what they don’t know, they’ll research) and offer suggestions for sites throughout Montana to find a little treasure of your own. As Owner, Patti Albrecht, confesses, “It’s addicting.” And, fortunately, relatively easy to engage with minimal cost – Albrecht has a nice selection of gold pans for under $10. The only rock shop in Gallatin Valley, Earth’s treasures not only stocks a wide selection of beautiful rocks, minerals, crystals and fossils, but also has everything you might need to initiate the hobby. Popular sites such as Crystal Park and Ruby Reservoir yield easily accessible crystals and garnets, respectively. In a time when most people are struggling to make ends meet, these hobbies provide a welcome reprieve and facilitate inexpensive family fun. While a weeklong vacation to Disneyland might be out of the question, weekenders throughout the state finding a little magic in the natural kingdom is not only affordable, but surprisingly exciting. Earth’s Treasures also prides itself as a fun and educational place for children. “I always thought it was important to have affordable things for the kids,” says Albrecht. Hosting educational field trips for children and adults alike, Earth’s Treasures nurtures excitement about Montana, history and the natural world. With items as inexpensive as fifty cents, Earth’s Treasures is truly a treasure trove for children. Offering a free rock for just coming in and continuing a long-time policy of giving kids 10% off when they come in with their allowance money are just a couple of the ways that Albrecht encourages children to explore and fall in love with the natural world. Albrecht’s unswerving dedication to quality, passion for these natural beauties and commitment to her customers is reflected in every hand-selected piece that graces her shelves. “We really have tremendous customers. They like to share their knowledge and help one another. And, they’re fun – all as passionate about these beautiful treasures from around the world as we are.” Albrecht has truly fashioned a beautiful and delightful experience for her customers. At once both intriguingly exotic and intoxicatingly wonderful, Earth’s Treasures re-awakens the slumbering child in all of us, illustrates the first few pages of the treasure hunting stories we all remember and then sends us on our way to realize them. Located at 25 North Willson Ave, just a half of a block off Main Street, Earth’s Treasures is open Monday through Saturday, from 9:30AM to 5:30PM. For more information on any products, services or monthly web specials, please visit www.earthstreasuresmt.com or call (406) 586-3451.